If you like the look of a cap toe shoe then you will love these unique cap toe style dress shoes by Steven Land. 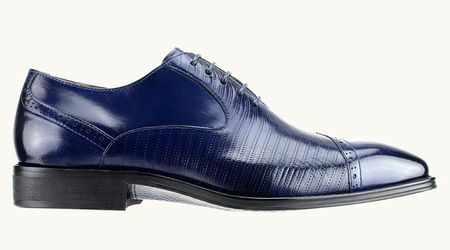 These navy blue leather shoes with a perforated design in the middle of the shoe have the classy look you need with a unique wing tip style cap toe. Wear these shoes with a suit or even for a night out on the town.